We’re kicking off the event with some great Halloween and/or scary book recommendations! 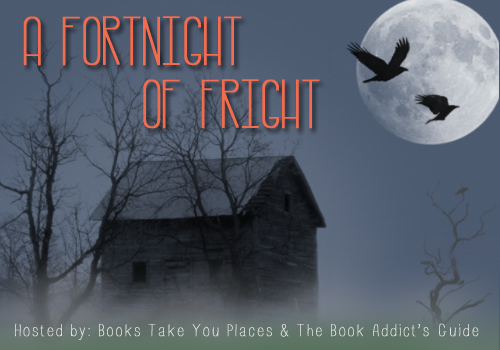 We’re providing you with some of our own favorite horror, paranormal, and Halloween-feeling books as well as some recommendations from your fellow bloggers! First up, Emma from Mab is Mab is sharing a wonderful book with us! “My Halloween book recommendation is Florence and Giles by John Harding. I adored this book! It is a ghost story of the classic variety, lavishly gothic and dark although written very recently; there is an old, creaky house, a governess, and some very creepy kids! It builds up such a tense atmosphere, as all good ghost stories do, and the final moments are shocking and brilliant. Next up, we have a few selections from Pamela at Reading is Fun Again! And next up is Candice from The Grown-Up YA! Thank you so much to all of our bloggers who gave us some fantastic Halloween recommendations! We’d love to hear what everyone else’s favorite Halloween reads are as well! What books get your heart racing? This entry was posted in A Fortnight of Fright, Blog Event, Books and tagged A Fortnight of Fright, Books, Halloween, Horror, Paranormal, Recommendations, Vampires on October 17, 2013 by Brittany. Thanks for featuring my picks too! I am looking forward to settling down with some more spooky books for the month. I’m not much for spooky/scary reads, which explains why I haven’t read any of these books! But I am admittedly curious about Florence and Giles (which sounds creepy in a good way) and Dracula (because VAMPIRES). I might just have to steel myself and check them out!